What is Mentoring looks at the definition of mentoring, the different approaches to mentoring, the difference between mentoring and discipleship and what mentors do. Mentoring is a term that is readily used within organizations and churches. Therefore, it is important to understand what mentoring is. Here are some definitions. "Mentoring is a relationship which gives people the opportunity to share their professional and personal skills and experiences, and to grow and develop in the process." "Mentoring is a relational experience through which the mentor empowers the mentoree by sharing God-given resources." "Mentoring is a process of developing a person to his or her maximum potential in Jesus Christ in every vocation." If you look at these definitions, you will see three common threads. A) Mentoring involves a relationship. B) Mentoring involves resources. 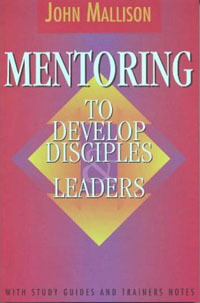 C) Mentoring involves development or empowering. You cannot mentor someone from a distance. Mentoring requires a personal relationship whereby you come together to invest in the life of another person. "Typically, it is a one-to-one relationship between a more experienced and a less experienced person. It is based on encouragement, constructive comments, openness, mutual trust, respect and a willingness to learn and share." Mentoring involves resources. These resources may include skills, experience, character, knowledge, wisdom, contacts, networks or maturity. A mentor must have something to impart to the mentoree. To mentor someone is to develop or empower someone through the mentoring relationship. Role mentoring involves imparting resources to empower the mentoree to do a specific role. Soul mentoring involves developing character within the mentoree. Whole mentoring provides a role model for the mentoree. Discipling and mentoring are similar terms. However, discipling describes the relationship between a new Christian and a mature Christian in which the mature Christian spends time with the new Christian in order to establish the new Christian in the faith (spiritual disciplines). On the other hand, mentoring is a boarder term which can describe many difference relationships between two people. Mentoring may not involve spiritual content. 4. What Do Mentors Do? Anyone can mentor someone as long as they have something to offer the mentoree and the mentoree is willing to be a participant. These are some of the benefits of mentoring. Once you have finished the mentoring program, it is important to evaluate how the program performed. This gives you the opportunity to rectify any problems with the program. For more information about this subject, click on what is mentoring?